The Alliance on Underage Drinking (ALOUD) and The Council on Alcohol & Drugs are pleased to open registration for the 17th Annual BuzzFree PROMises Dress & Suit Giveaway to be held on Saturday, March 24 at the Kathlyn Joy Gilliam Collegiate Academy, 1700 E. Camp Wisdom Road, Dallas, 75241. Check-in will begin at 9:30 a.m. and the event will be from 10 a.m. to 3 p.m. Pre-registration for this FREE event is required at surveymonkey.com/r/buzzfree2018. Prom night is BIG … and when alcohol and other drugs enter the picture, the consequences can be devastating. The BuzzFree PROMises’ mission is to encourage and reward healthy choices made by high school juniors and seniors in our area. The group hopes to prevent and reduce underage drinking, driving under the influence and use of other drugs, especially around the critical time of prom and graduation. BuzzFree PROMises Dress & Suit Giveaway helps local teens (girls and boys) obtain prom attire but includes educational components not usually found in other prom attire giveaways. 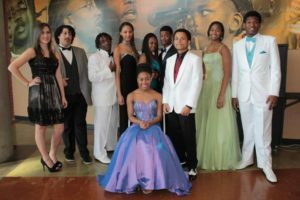 In exchange for their pledge to remain drug and alcohol-free, students participate in a variety of workshops and are rewarded with a prom dress, tux or suit. The event will include a fashion show and keynote speaker. Lunch is provided as well. The Council on Alcohol & Drugs facilitates BuzzFree PROMises Dress & Suit Giveaway through its coalition, the Alliance on Underage Drinking (ALOUD). BuzzFree PROMises is a natural extension of The Council’s 70-plus-year legacy and expansive network of programs preventing problems with alcohol and other drugs before they occur, intervening when they do, and promoting recovery for people already addicted. Other community partners include the Dallas Area Drug Prevention Partnership (a program of The Council on Alcohol & Drugs), WhatchamaCallit, Dallas ISD, Red Oak ISD, MADD and Impact Communities. One Response to "Free clothes for a PROMise to stay drug free"
Hey there! I’ve been following your website for a long time now and finally got the bravery to go ahead and give you a shout out from Porter Texas! Just wanted to say keep up the great work!